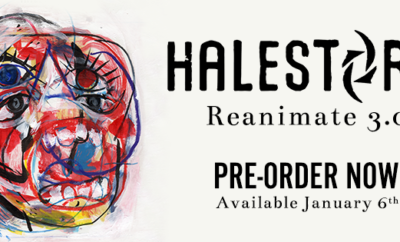 Halestorm Announce New Album and Release New Single! Halestorm have announced today their new upcoming album, Vicious. The GRAMMY® Award-winning band’s fourth studio album, Vicious arrives at all music retailers and streaming services on Friday, July 27th. The first single from Vicious, “Uncomfortable,” premiered this morning, and the video, directed by Evan Brace (Phantogram, Taking Back Sunday). 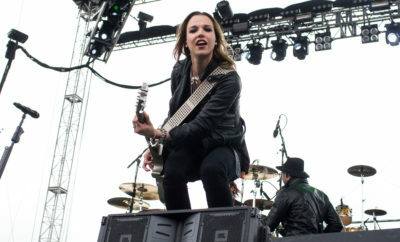 Halestorm will discuss the upcoming album in several live events tomorrow, May 31st. The band will first participate in a Facebook Live interview with hard rock and heavy metal site Loudwire. Tune in to https://www.facebook.com/LoudWire/at 12:45 PM ET. Next, Huffington Post Managing Editor of Culture Lauren Moraski will host an interview and live Q&A as part of the BUILD Series at 3:30 PM ET (tune in at buildseries.com), followed by “An Intimate Evening of Music & Conversation with Halestorm” at New York City’s Sony Hall. Presented by BackStory Events, that concert will include a long-form interview by journalist and founder of the Women’s International Music Network, Laura B. Whitmore, audience questions, and an exclusive performance. The sold-out event will be streamed live via the official Guitar World YouTube channel beginning at 7 pm ET. Halestorm will embark on the second leg of their milestone U.S. tour showcasing all female-fronted hard rock bands. The dates – once again co-headlined by Roadrunner/Atlantic group In This Moment – get underway July 27th at Kansas City, MO’s SEC Arena and then travel through the end of August (see attached itinerary). Support throughout the trek comes from special guests New Year’s Day. The tour will include stops at a number of upcoming festivals and state fairs, including Oshkosh, WI’s Rock USA (July 12th), Cadott, WI’s Rock Fest (July 13th), Dubuque, IA’s Dubuque County Fair (July 28th), and Springfield, IL’s Illinois State Fair (August 11th). Other highlights include a one-night-only event supporting Joan Jett & The Blackhearts – set for August 9th at Moorehead, MN’s Bluestem Amphitheater – as well as a free concert on Las Vegas, NV’s Fremont Street (August 25th). For ticket information, VIP packages, and details on joining the Official Halestorm Fan Club, please see www.halestormrocks.com. ← Previous Story Clairo Announces Summer Tour! Blake Shelton Announces 2016 Tour!